I like to take things apart and figure out how they work. One of the most fascinating machines I’ve tried to understand recently is the way we allocate scarce resources – economics. It is interesting for many reasons, and one of them is that many people have very strong opinions about it, even people who know very little about it. The system itself is also interesting because it is like a living organism, shifting and evolving with the times, and its early history, tied in with that of our civilization, predates writing, making it difficult to determine the exact order in which things happened. I was once asked “how is it that a 21-year-old kid in Norway can work for six months a year, then travel the other six months, when people here (we were in Mexico) have to work their asses off just to survive?”. This is the a good question, as it puts into stark contrast the income inequality between countries in a very concrete way. The Norwegian in question was working in airport security as the guy who runs the mini metal detector over you if you walk through the big metal detector and it goes “beep”. This is not a very highly-skilled line of work, nor was the pay very high, at least not by Norwegian standards. Anyone who has ever been to Norway will know that the Norwegians enjoy a very high standard of living. Everything is very expensive, but so long as you work in Norway, then your pay is correspondingly high. This guy’s pay may not have been high compared with other Norwegians, but it was high enough to sustain half-year-long trips through Latin America. So when you cross a border, you can unexpectedly become a little richer or poorer without doing anything. In general when you pass from a more developed country to a less developed one, your money will suddenly be worth more. Why does this happen? If we step back in time a little to a point in civilization not long after the advent of agriculture, we have small settlements of people who each grow their own food, and make their own clothes and tools. Eventually, they figure out that if they specialize – one group concentrates entirely on farming, another concentrates on making tools, and so on, that they will be more productive and end up with a little surplus with which to exchange with each other, and other settlements. The system slowly grows more and more complex, bringing greater and greater degrees of specialization, and therefore higher productivity. So one of the reasons is simply because there is more value in another country’s economy. The high degree of specialization also means that it can sustain a population of very specialized (generally, highly-skilled) workers who are in high demand. This surplus and specialization also means higher education, which churns out more productive people. Even though university students spend a lot of their time playing angry birds and don’t seem very productive, because of the principles of comparative advantage, and supply and demand (low supply, high demand), the work that they do “counts” for more. But say you take two advanced economies, like Britain and Norway. Things are still much more expensive in Norway than Britain, and Norwegians still seem to make a lot more money. First of all, when adjusted for “purchasing power parity”, the difference isn’t so great. Purchasing power parity is simply a fancy way of measuring how far your money goes. If the average salary in a country is a million dollars, but the average price of a hamburger is ten thousand, then those people aren’t really better off than if they lived in a country where the average salary was only a thousand dollars, but burgers only cost fifty cents. Something else is making Norwegian Krones go a little further than British Pounds – Oil. Oil is the world’s most valuable commodity, and rightly so – it is our main source of cheap, portable energy. It is also finite, so its increasing scarcity drives up its value. Norway has a lot of oil. It also has an oil fund that takes the profits from this oil and invests it back into its people, an investment that increases in value with time. If natural resources make a country wealthier, then why are so many people from countries rich in natural resources so poor? Well… so far, we’ve only been looking at averages, which can be deceptive. The average guy coming out of Norway is quite wealthy, and our experience with people coming out of Norway corroborates that. However, the average Saudi Arabian citizen who we might bump into in Saudi Arabia is not so wealthy, even though the average wealth is quite high. This is due to massive income inequality. Natural resources can be a blessing or a curse. A blessing because, for almost no effort, you can add value to your economy, a curse because the initial extraction centralizes and concentrates power to an extent that can reinforce dictatorships. Unfortunately, cases where natural resources have been used to the benefit of many rather than a select few have been the exception rather than the rule. Nevertheless, resources do add value to an economy. So it’s all very well to compare wealthy countries with poor countries, or wealthy countries with each other, but what about between poor countries? In the postwar period, most of the world except for North America, Europe, and Japan lived in extreme poverty. Now, many Asian countries, while still very poor, are showing steady growth and development. However, many countries in Africa continue to struggle with extreme poverty, and some have even gotten poorer in real-world terms. Take Indonesia, a former Dutch colony and compare it to say Mozambique, a former Portuguese colony. After the various adjustments mentioned above, Indonesians are, on average, over four times more wealthy than the average Mozambican. Mozambique, although achieving independence much later than Indonesia, and suffering a brutal civil war, has enjoyed a relatively stable democracy for some time, while Indonesia has struggled through dictatorship and regional and sectarian conflict. Here I believe the main difference is that agriculture is far more productive in Indonesia than it is in Mozambique. In Mozambique, about 80% of the workforce is employed in agriculture but most of it is of the subsistence variety, Indonesia’s economy is much more developed with agriculture accounting for only 44% of the workforce (to feed a population almost 10 times Mozambique’s), and it being a major export. When you can use far less of your workforce to produce more food than you need, then you have much more headroom to grow a diverse and productive economy than if 80% of your workforce is struggling to feed everyone. Indonesia has been exporting food for centuries because its soil is very fertile. It is volcanic and contains lots of nutrients and, as a result, some of the islands support some of the highest population densities in the world. Agriculture generally isn’t the driving force behind very wealthy countries, but poor agricultural output can be a severe limiting factor to economic development (starving people aren’t very productive). The climate also has a large role to play in this, as frequent and predictable rainfall allows farmers to plan and therefore be more productive. 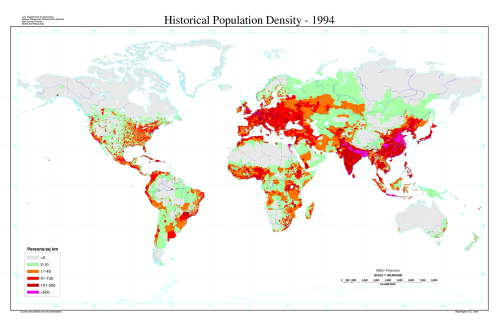 Infrequent and unpredictable rainfall leads to hunger and famine, which are well-known catalysts for social upheaval, which generally puts large dents in economic development. You can harp on about stability under authoritarian governments all you like, and all the corruption in African governments, but the fact of the matter is that very corrupt governments are endured everywhere, and real stability comes from food stability which in turn comes from climate stability combined with good soil. So while climate change is simply a minor inconvenience to most of the world’s developed countries, who live in stable temperate climate zones, it will wreak havoc on the unstable climates in the world’s most impoverished places. Of course, no single one of those reasons accounts for all of the economic disparity in the world today. But the answer to the original question is that our Norwegian airport security guy was just lucky enough to be born in a country with a highly-advanced economy, stable climate, good soil, and an abundance of a valuable natural resource. Of course all of these factors multiply each other, and do so over time. Although Norway wasn’t exactly a huge colonial power, it benefited from the added wealth that other European powers gained from their colonies. The same rule that applies to generations of people through time also applies to countries through time – the largest single predictor of future wealth, is current wealth. Just because someone happens to be born in Mexico, Indonesia, or Mozambique doesn’t mean that it is impossible for them to pull themselves out of poverty by their bootstraps, but it does make the task a lot more difficult. If you grow up surrounded by people who never went to school, you are a lot less likely to finish university than if you grew up in a country like Norway where something like 40% of people finish some kind of tertiary education. Can we solve this disparity? Obviously, in principle, you can always solve any given wealth disparity by redistributing all the wealth, however that may not be such a good idea in practice. The current per capita world GDP adjusted for purchasing power parity is something like 10,000 USD, which seems like a pretty decent amount of money. 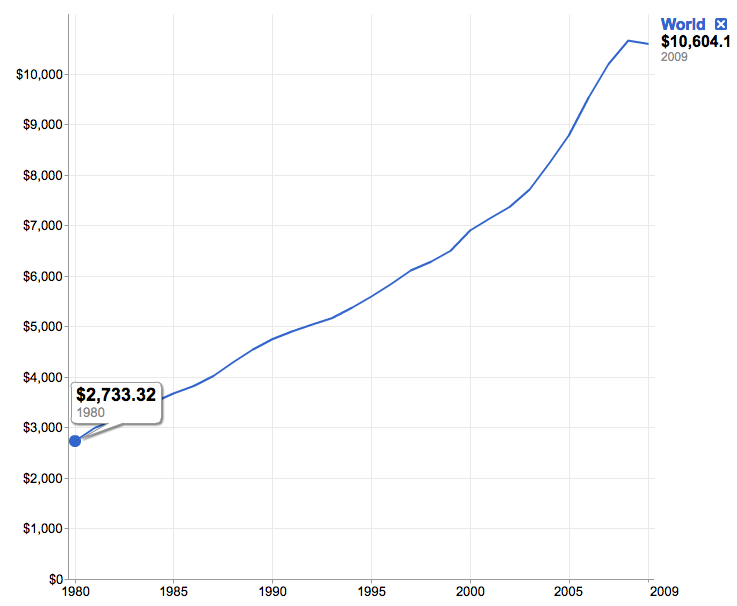 Of course, this amount has nearly quadrupled since 1980 and we can probably expect similar growth in the future. While we can expect levels of technology and education to converge as time goes on, the world’s natural resources remain unevenly distributed throughout the world, and the world’s rainfall patterns follow a similarly nonuniform distribution. So while mobile phones and the internet are definitely making the world flatter, for an hour of work in Norway to be paid similarly to an hour of identical work in Mexico a huge amount of wealth redistribution will have to be seen, and sadly this I can’t see happening in my lifetime.